This week I had the chance to stop at Beaubourg in Paris, There the “Centre Pompidou” is putting on a retrospective of Pierre Soulages. He is called the “painter of black and light”. It’s fascinating to see what emotions those paintings can create just by using black. Black is not even a color right ? We live in a world where we are constantly subject to complex messages, I was attracted by the simplicity and emotions of the paintings. Of course the monumental size of the works and the place itself present the artist on it’s best light. Princess was with me and she did not like the exhibition at all. “The work is too cold and frightening” she was saying, she was walking too fast indeed, as she was afraid an alien could escape from a painting, maybe it could have happen. I was joking with her and I was saying that I would like to have one of his paintings in my office, she did not like it, and as she was telling that she was walking even faster. 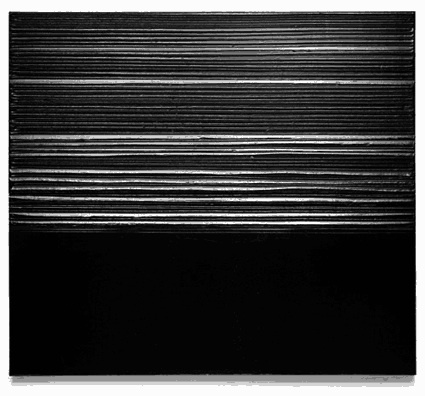 Indeed I was not joking, when you are developer you need to simplify things a lot to get to the essential, the work of Pierre Soulages get me to that feeling. The exhibition start with the early works, where he was still searching, he was struggling with huge black lines, maybe trying to make them say something impossible. Then suddenly he started to paint entirely the surface with black and it’s there that it’s becoming interesting. I wonder what king of music Pierre Soulages is listening, too me it goes with the Bach partitas but the ambient work of Biosphere fit also perfectly. If you have a few hour to spend in Paris the exhibition will last until the 8 march of 2010. We plan to ship the final version at the end of this month so we encourage you to check if this new version is working fine and to report any problems or suggestions by creating a topic in the GrandVJ forum. Happy testing, we hope you will have as much fun using this version as we had to code it!